Do you overweight? Use ?My Health Status Pro? application to find out your health status. Do you overweight? Use ?My Health Status Pro? application to find out your health status. In this product, you can calculate your BMI (Body Mass Index), BMR (Basal Metabolic Rate), BFC (Body Fat Calculator), Heart Rate and find out your daily calorie needed to maintain your weight. BMI is used to measure your ?Body Mass Index? using height and weight in both standard and metric system. Poor physical activity and eating behavior can lead to excess body weight, which is a significant contributor to the risk of acquiring chronic diseases. BMR is used to measure TDEE (Total daily energy expenditure) of a person using height, weight, age and gender in both standard and metric system. BFC is used to calculate your body fat percentage using the US Navy formula. For measurement, you do not need to use calipers instead you need to use a tape to measure your waist, hip and neck. * Organize your daily life using ?To Do List? with various categories. * Calculate BMI based on height (ft/cm) and weight (lb/kg). * Calculate BMR based on height (ft/cm), weight (lb/kg), age and gender. 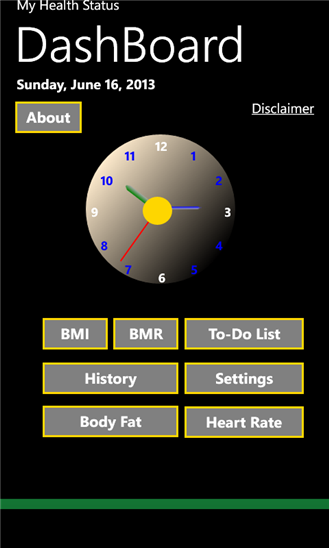 * Find your health improvement using BMI and BMR history.
. BFC calculates your body fat percentage.
. Calculate Target Heart Rate based on age to find out how hard you need to do exercise to burn enough calories.